come the revolution, there will be bicycles seen far into the distance. cars will be the preserve of the extremely wealthy because petrol will have increased in price beyond the space for such on current petrol pumps, and we'll all be travelling to and from the supermarket, post office, corner shop on our proper bicycles with panniers, baskets or trailers. this is either absolute hell or total nirvana depending on how you view your cycling. would we all be so desperate and willing to head out into the hinterlands of a sunday morn, if the daily travail started and ended with a bike ride, while saturday mornings meant perhaps two trips in the company of her indoors to get the weekly shop? i have serious doubts as to whether that's realistically in our future. the great majority are so wedded to their motorised vehicles, that some sop passing as an environmentally sound solution will happen along to keep them in their metal boxes. however, that does not mean that the revolution won't just happen a tad more quietly; i don't know about you, but folks nearer at hand who have always poo-pooed my exhortations to plonk bum on saddle, have started either cycling just a bit, or have been asking for recommendations as to where to buy. the demon in me wants to taunt them over their previous recalcitrance, but judging that to be slightly counter-productive, i have kept my smile to one of acceptable formality. but with all those extra bicycles rolling across roads fit for bulldozers, there's every likelihood that mechanical insurgencies, or even breakdowns may well occur. it has something to do with statistics and sod's law. keeping the demon in check here, it would be somewhat arrogant or possibly wicked to figure i'm alright jack, since the innards of the average, and not so average, velocipede, are not unknown to me. racked on the wall of thewashingmachinepost bikeshed is a wide range of tools, gathered with the specific purpose of keeping cycles in fine fettle. granted, a number of them fit now defunct components, but you just never know when one of those is going to turn up. and perhaps, like clothing styles, they'll come back into fashion someday. islay's just a wee place, so the existence of only two bicycle fettlers on the island is probably just about right; sections of the mainland seem generally well-served, though i've no doubt there are far flung pockets without a bicycle mechanic in the vicinity, hard though that is to believe. but even if there is a trusty bicycle repair man/woman to hand, they are likely to be more forthcoming with that free cup of coffee if you can describe the ailment more specifically than it's making a noise. as previously discussed, there is a veritable mountain of repair books on the market, some more accessible than others, but all destined to make you feel more confident about dealing with those pre-ride checks, or mid-ride emergencies. and while i have a great deal of affection for the printed page, i'd have a hard time arguing the case for carrying an entire volume of barnett's repair manual in a back pocket. however, technology being what it is, a more compact and bijou solution is readily at hand. unless you've been on a very extended bicycle ride over the past few years, it cannot have escaped your attention that app-mania is upon us. in fact, at the start of the giro d'italia i acquired an app for my ipod touch that presented me with the teams and their riders, plus all the stages. sadly, it wasn't all it was cracked up to be, but then it didn't cost anything anyway. but the possibilities were there, and more to the point, they were there. by that, i mean, i had the ipod with me at most times of the day, though occasionally without w-fi for updates. the clue, however, is in the name mobile phone, and i notice that a number of apparel providers currently designate the smaller pocket as one capable of carrying just such a device. therefore, the ability to carry around a concise manual aiding the less mechanically inclined to track down those unrecognised noises or, perchance, to wield an allen key in the direction of its repair has to be seen as a good idea. 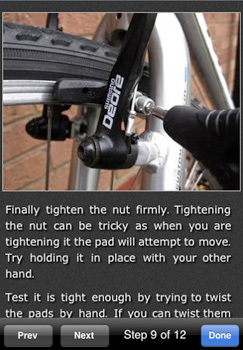 it will surprise you not at all, therefore, that just such an app exists, under the name of bike doctor. 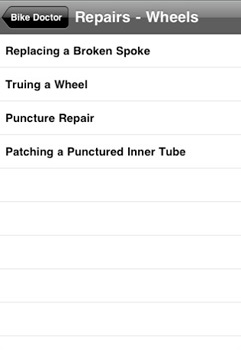 this app can be downloaded from apple's app store direct to either iphone or ipod, and presents a series of repairs or checks that can be made by any cyclist before, during or after a bike ride. 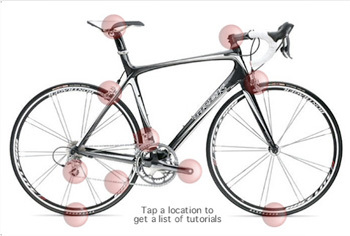 the opening menu presents a list of the type of repairs contained within, and for the benefit of those who are not familar with the terminology, the screen can be switched to a profile of a bicycle with a series of hot spots over relevant points on the bike. each repair or check is presaged with a list of the necessary tools and an overview of what follows. the fix is broken down into manageable chunks and well illustrated with photos to aid your wrenching. in its current version, there is a slight bias towards owners of knobbly footed machines; cantilevers and v-brakes are covered, but calipers are conspicuous by their absence. and nowhere is there sign of bendy bars and the attendant wrappings. however, the basics are here: repairs that are common to all bicycles, irrespective of type; puncture repair, broken spokes, wheel trueing, gear adjustment and chain cleaning to mention but a few. on that latter note, i see from the photos that the app recommends the use of one of those chain wash doohickies, something i am personally not in favour of, but certainly quicker than polishing each link with brasso (oh yes i did). those possessed of unparalleled mechanical ability probably do not need to apply, but i am constantly amazed at the utter lack of such bestowed upon those with several thousand pounds of carbon fibre in the bikeshed. and bearing in mind the sizeable investment some folks have in their bicycles and indeed, their iphones, £2.99 seems a (very) small price to pay for such a carefully considered application that could allow even the most ham-fisted to maintain their pride and joy. if you're a bike shop employee reading this and thinking oh, just great, in a sarcastic tone of voice, be aware that when the repairs start to head towards the more complex end of i don't know what i'm doing, the app recommends seeking professional assistance from those more qualified. a sound suggestion i would tender, and a nice touch that makes this an excellent addition to that apple device. i have contacted the progenitors of the bike doctor app regarding the lack of one or two nods to the roadies amongst us, and i'm encouraged to learn that version two might address our conceit.